Home / Adviart Blog / Follow your heart. Follow your heart. 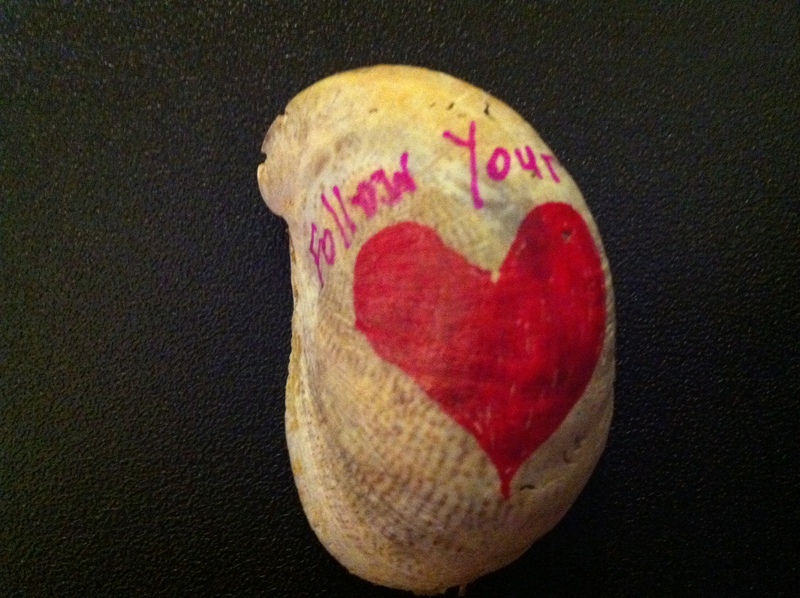 This adviarter picked a shell to write a mix of words and drawings to display her advice. The shell is symbolizing the need/interest to follow your passion–let your heart drive your decisions in order to bring happiness and peace to life. Following your heart is not easy advice. For anyone overly analytical, turning off the mind and the supposed “rational” thought to follow the heart can be an obstacle on a daily basis. Following your heart is about trust and knowing self. If you don’t trust your own heart, how can you follow it moving forward? If you don’t know yourself, how can you begin to identify which is speaking–mind or the heart. I think a lot about the decisions I have made when I have followed my heart versus when I have let my mind prevail, I can’t say that there is a direct correlation to more success in one over the other at this point but I can say that the endings of chapters are a lot easier when you follow your heart. Perhaps when you follow your heart, you can handle anything, no matter what happens because there is always a benefit that can be found–a satisfaction from making that conscious choice to be happy or follow that passion. When you use only your mind, the outcomes can be much less value-driven or satisfying if you aren’t careful. My challenge is to figure out a way to be able to check my decisions to ensure they follow my heart over my mind. Right now, I think it might just be a group of strong friends who are willing to call me out when I follow my mind versus my heart. Maybe they will always need to be there (I hope so) though I certainly hope that I have less reliance on them when it comes to making decisions of the heart. If I can’t learn to do this more on my own, I won’t be growing as a person. Follow the passion, live boldly with heart–such strong statements. So how do you ensure that you are trusting your heart and more importantly, following it?